Martin Russell’s men score their 50th goal of the season in five-goal demolition. Paul O'Conor was on target this evening. FREE-SCORING LIMERICK put Munster rivals Waterford United to the sword at the Markets Field on Saturday evening – hitting them for seven. The result comes at the end of a week which saw Waterford hold an emergency meeting in a bid to raise €80,000 to survive until the end of the season. The runaway First Division leaders hit the front after just 47 seconds. A clever move after catching Waterford in possession resulted in Stephen Kenny breaking free down the right flank. John O’Flynn held his run to the back post and made no mistake in converting past Kevin Burns. Waterford were daring – Eoin Rhodes partnered Philly Gorman up top and their bravery was rewarded after 18 minutes. Shane Duggan failed to intercept a cross-field pass and former Limerick midfielder Dave O’Leary had space to advance. He took two touches before powering a rocket from all of 30 yards into the top corner. Freddy Hall may be disappointed, but nothing can be taken away from the strike. The game stretched at this point as both sides had chances. Hall saved wonderfully from a Rhodes effort and seconds later, John O’Flynn headed in a Shaun Kelly cross from 12 yards to put the Blues ahead before the break. Just as it seemed the game would be in the balance going to the break, O’Flynn netted his hat-trick. The Waterford backline pushed up and the in-form striker bent his run in between centre halves. A simple ball over the top left him one-on-one and he converted with ease. 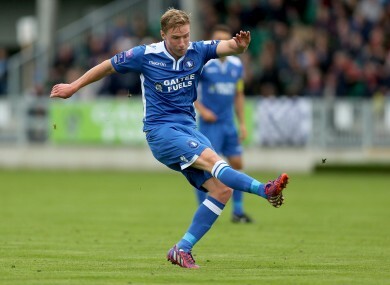 James O’Brien netted twice for Roddy Collins’ Blues against Limerick in March. His stunning strike from the edge of the area on 54 minutes halved the Limerick lead before Paul O’Conor restored it ten minutes later. Stephen Kenny, Chris Mulhall and O’Conor added goals late on to take Limerick’s goal tally to 51 in all competitions after just thirteen games. Meanwhile, in the weekend’s other games, Shelbourne and Drogheda United recorded victories on Friday evening to boost their respective promotion challenges. Shels saw off Athlone Town 2-1 at Tolka Park thanks to goals from Aidan Collins and James English while Drogheda had Aaron Ashe’s first-half strike to thank for their win over Cobh. Limerick: Freddy Hall; Shaun Kelly, Paudie O’Connor, Tony Whitehead, Shane Tracy; Paul O’Conor, Shane Duggan; Stephen Kenny (Ross Mann, 76), Garbhan Coughlan (Lee-J Lynch, 23), Aaron Greene; John O’Flynn (Chris Mulhall, 70). Waterford United: Kevin Burns; Dean Reidy (Aaron O’Connor, 46), Colm Nugent, Roy Butler, Dylan McGuire (James Dermody, 46); David O’Leary; Robert Buckley (Shane Mackey, 69), Anthony McAlavey, James O’Brien; Eoin Rhodes; Philly Gorman. Email “Waterford's difficult week compounded as high-flying Limerick hit them for 7 ”. Feedback on “Waterford's difficult week compounded as high-flying Limerick hit them for 7 ”.